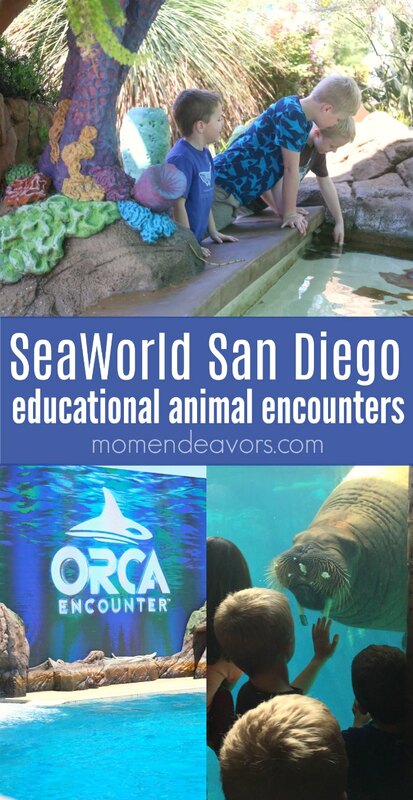 This educational family travel experiences post is part of a sponsored campaign with SeaWorld San Diego. All opin­ions, expe­ri­ences, pho­tos, and love of ani­mals are entirely my own!! As a former biology teacher, it’s no secret that we LOVE animals and I love seeking out educational opportunities when we travel. 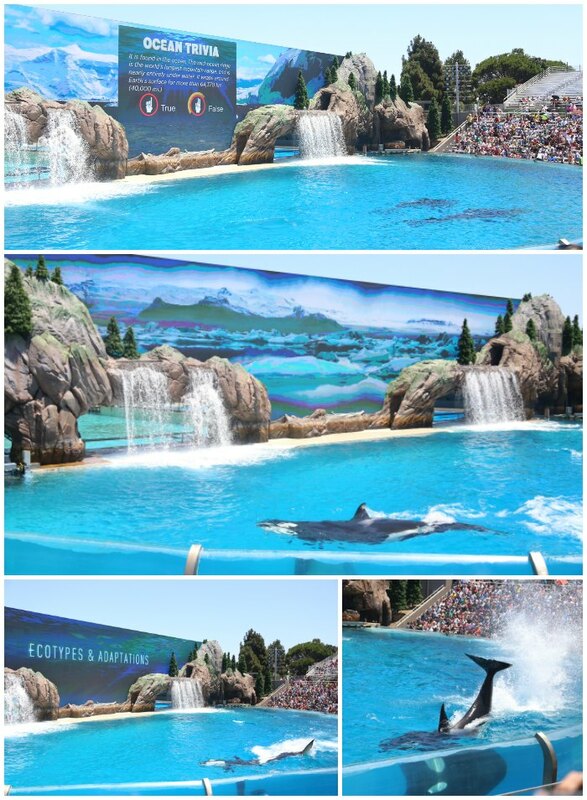 When in San Diego, a great option is SeaWorld San Diego – especially for those interested in animals and the ocean. We just spent a day there with the boys and had such a great day! Just as it was for me as a kid, the boys’ favorite experiences were the animal encounters! They’re still talking about the “cleaner fish”. Those up close and personal connections to animals can be so meaningful and educational..and exciting! As an educator, I’ve seen the power in that firsthand. So, today I’m sharing our Top 5 list of educational animal encounters at SeaWorld San Diego: 1. Visit Explorer’s Reef – the opportunity for a SUPER cool and educational animal encounter occurs as soon as you enter the park. Here you’ll find a whole series of different touch pools and Animal Care Ambassadors are on hand to answer questions. We spent a good 30+ minutes here on our visit and the boys wanted to go back again later in the day. 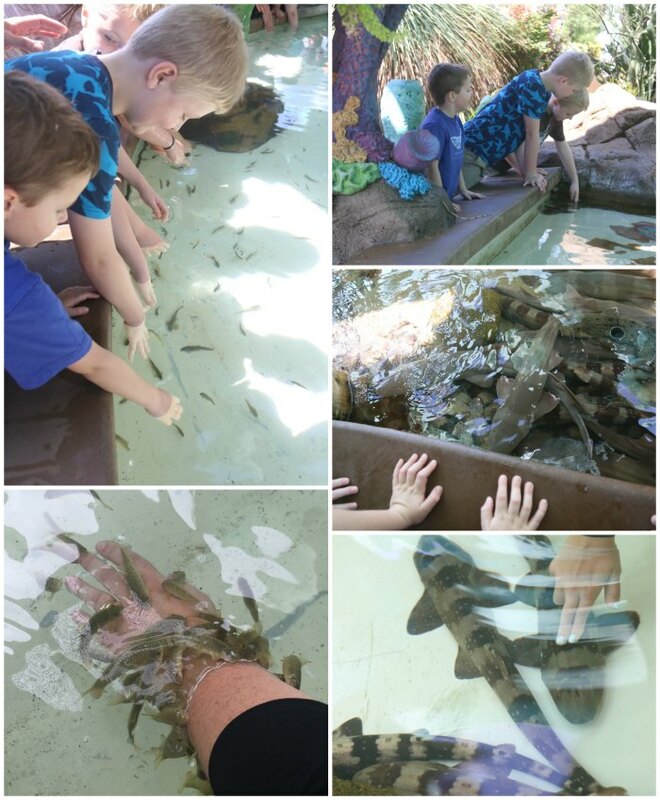 There were “cleaner fish” that the boys could NOT get enough of, pools of sharks you could touch, and a pool of horseshoe crabs! This was a great interactive and educational way to start our time in the park! 2. Feed the animals – Another great way to have personal experiences with the animals is to feed them! At spots like Sea Lion Point and the Forbidden Reef area, there are various times where you can purchase food to feed animals like sea lions and rays! 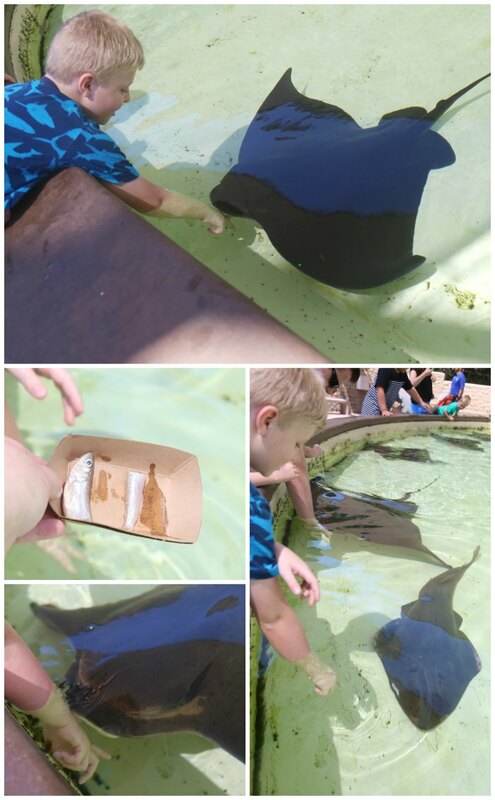 The boys LOVED seeing and feeling how the rays eat! Such a cool experience! 3. Interactive Exhibits in Wild Arctic – Not only is this THE place to be at the park on a hot day, but Wild Arctic is a great place to spend time with the animals and check out the interactive exhibits. There’s a wall of ice, a fun polar bear den to crawl through, a ride you can do, and various arctic animals. Another great thing about this area is that you can see the animals from different perspectives – both above and below the water! 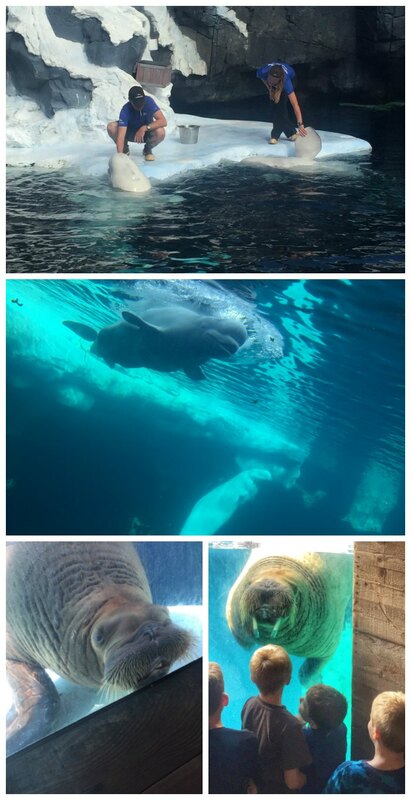 We especially love the walruses and beluga whales! Such fascinating creatures! 4. Experience Orca Encounter – SeaWorld debuted this new documentary-style orca experience at the San Diego park this summer (2017) and as a former teacher, I LOVED it! The educational storytelling is presented on a three-story, first-of-its-kind infinity screen, amidst a Pacific Northwest theme. Before the show starts, the audience is encouraged to participate in some ocean trivia. Orca Encounter combines educational graphics and footage of whales in the wild on the infinity screen while the whales at SeaWorld demonstrate some of those same behaviors (like breaching, splashing, and spy hopping). 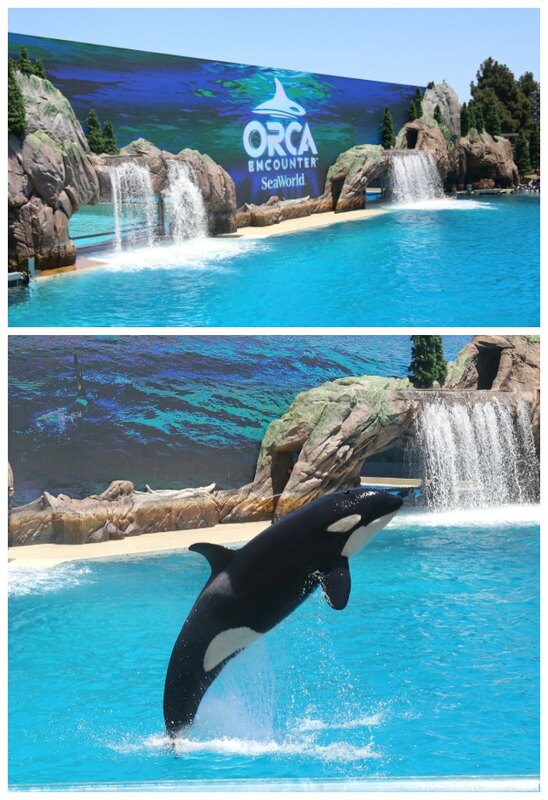 Not only are the behaviors demonstrated, but the presentation explains how and why the whales do these behaviors. The combination of the visuals on the giant infinity screen and the whales in real life really made this a powerful educational presentation. My boys were engaged the entire time, learning and absorbing all kinds of information about orcas, whales in general, and the ocean. This is a MUST do! All of the experiences (and more) listed above are included in your general admission ticket – all providing GREAT educational opportunities and many real hands-on experiences. If you’re wanting even MORE animal encounters or an extra special experience though, you can book an exclusive experience – like encounters in the water with some of the animals or going behind the scenes! 5. Book an exclusive experience – Have you ever wanted to get in the water to interact with a dolphin or a beluga? How about dining with orcas? How about getting up close with penguins or sea lions? 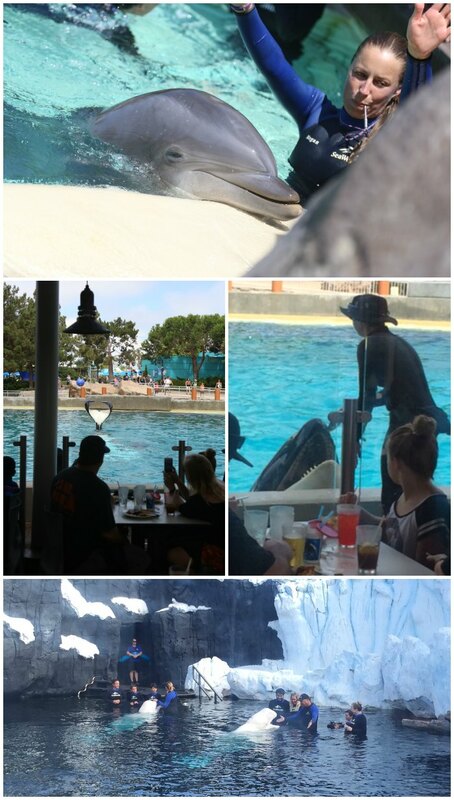 These are all exclusive experiences that you can add on to your SeaWorld San Diego trip. Talk about memorable educational experiences! We got the chance to dine with the orcas and it was SO cool! And these were just our top experiences – there are still SO many more animal encounters to experience at SeaWorld San Diego! We hadn’t been to SeaWorld in a few years and we were so glad to go back! Our family had a great time learning, exploring, and making memories! What are YOUR favorite educational experiences there? So, if you’re planning an upcoming trip to San Diego, consider including SeaWorld in your itinerary. You can even find some great SeaWorld ticket deals (like $20 off, kids free during October, get 2nd extra day free, etc)! Love love love Sea World, we always have such a great time when we go. Our oldest son just did a sting ray experience and it was the highlight of his summer!